Colourless Memories places an important marble in the mosaic from which, as time goes by, we piece together an image of the 1960s. 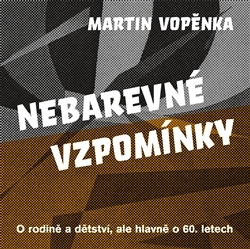 Few Czech authors have managed to portray this period so objectively, soberly and convincingly as Martin Vopěnka has. Vopěnka describes his childhood and family, doing so calmly, concentratedly and gently, so as not to disturb the gradual accretion of the “colourless colours” of his memory onto the canvas that he wishes to share with us, though as he writes he does not just record and describe, for he knows that his childhood is now in the irretrievable past, which is becoming increasingly remote. He now sees it from a historical perspective with the required detachment and he is able to calmly evaluate what he used to live in and what previously surrounded him. Within the calm flow of his narrative you can feel a strong passion on almost every page. Clearly, this book has a special importance for the author, in that he is internally reliving most of what he is recording.